When you discover a game has been created by NetEnt, then you can be sure of plenty of entertainment and fun. So Boku Slots was intrigued to see what was in store on the popular Boom Brothers slot. 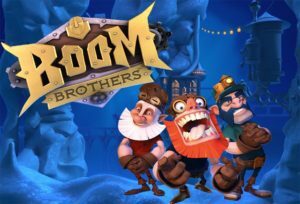 As you can imagine by the name, Boom Brothers is themed on 3 brothers working in a coal mine. But it’s the artistry of the graphics which has us hooked, because as well as being quirky they appear quite menacing. 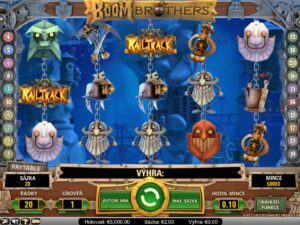 Boom Brothers is a 5-reel, 20 pay lines game, with a very healthy RTP of 96.10% and three extremely interesting features. The symbols look like metals and tools you’d expect to see in a coal mine. There are even metal work representations of the Boom Brothers, which we thought was a great twist. Bet Amounts – Betting begins at just 1p per pay line and can be increased to £1 per pay line. However, you can increase the coin level here from level 1 to level 5, as well as increasing or decreasing the pay lines in play. This means spins can vary from 1p when choosing 1 line at level 1, up to £100 per spin at 20 pay lines and coin level 5. Always check your coin level, pay line choice and bet amount before hitting spin, as this cannot be refunded once you play. Wild Symbol – The wild symbol in Boom Brothers is a bomb with its fuse burning. It substitutes for all symbols except the scatter and bonus symbols. It is the highest paying of the game and will award 7500 coins if you land 5 of the wilds on an active pay line. Scatter Symbol – The word rail track is your scatter, so if you land 3 or 4 of these you will get different multipliers for the win amount. Land five of these and you will have a higher multiplier, plus the bonus game will load as well. Bonus Symbol – Your bonus symbol is depicted by the words bonus spins and as you would expect it triggers the bonus spins feature. Land three or more bonus symbols to trigger the feature and you can be awarded between 8 and 50 spins. All wins are multiplied x3 during this feature and it is possible to trigger more bonus spins. Rail Track Feature – Land three rail track scatter symbols and you trigger the feature game. This bonus game will take you to a three-tier mining level. There will be a choice of three carts at the bottom and you simply have to choose one of them. Inside the cart is either a gold bar, a diamond or a ruby. In addition, there is a number that dictates how many steps across the tracks the Boom Brother on the correlating level can take. The first to the other side is the winner and you take home whatever bonus is inside the gems at the other side. Spin an entire reel so that it changes all symbols on show. Overall, we thoroughly enjoyed Boom Brothers, it had a lot going on but in a good way. The graphics were great and very steam punk themed, as well as marking the scenery out as a below ground mine scenario. Add in an impressive RTP and some interesting features and we can official say NetEnt have done it again!